As the name implies, the food is not grilled directly over the heat, but by hot air circulating around the food. There are two indirect methods: the drip pan method and the unlit burner method. Both rely on lower heat settings with the lid of the barbecue closed. With no need to turn or baste the bird, the result is worry-free barbecuing with little chance of flare-ups. Fill the drip pan to 1″ from the top with water, wine or juice and any herbs that might complement the flavours. As the juices and drippings fall, they mix with this liquid. The mixture vapourizes and rises up to baste the meat. 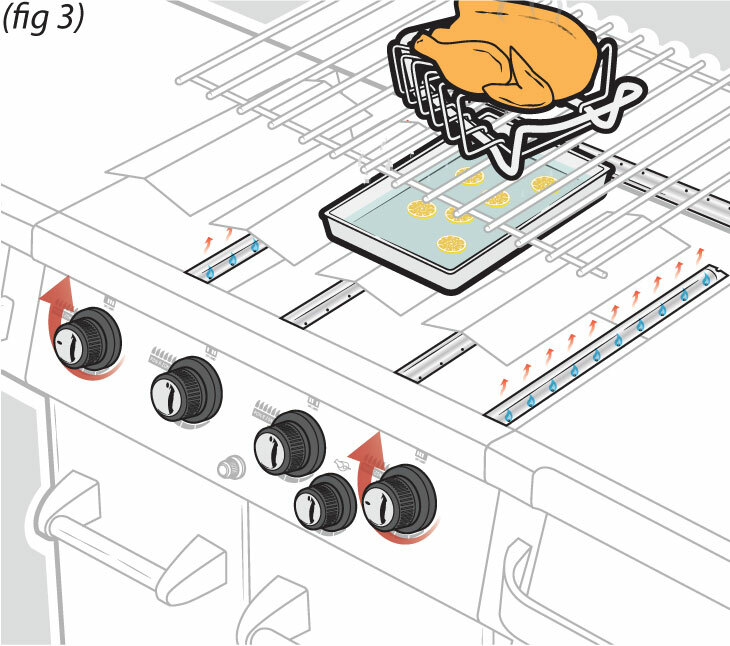 Place the meat directly on the grids above the drip pan. Note: Depending on the other menu items, and on the size of your barbecue, you may want to position the bird to one side, allowing you to prepare other dishes at the same time. Remove grids the warming racks. Periodically check the level of liquid in the drip pan, adding more liquid as required. Never let the drip pan dry out. The only accurate way to tell when meat is done is to use a meat thermometer Insert a thermometer into the centre of the meat. Do not allow the thermometer to touch the bone. Remove your turkey when meat thermometer reads 170° for breast meat and 180° for dark meat. Cover the bird and let stand 15 – 20 minutes before carving. This allows the juices to set and makes carving easier.